Hitting the snooze again and again until you realize you only have about five minutes to look put-together for class? Same. Macey Roth, a junior fashion student, and professional makeup artist, is giving us eight quick and wallet-friendly beauty items for busy college students- overachievers included. Late night studying and even the occasional all-nighter will definitely wreak havoc on anyone’s skin. Luckily, there are some uber affordable options that will smooth your complexion and make your face glow! “For the face, I use the L’Oreal Infallible Pro Matte foundation ($13 at Ulta). It’s really lightweight and easy to blend out with your clean fingers, if you don’t have a beauty blender on hand,” Macey explains. “To set my foundation, I use the e.l.f. loose powder that comes with an applicator, to help keep shine away”. The e.l.f. High Definition Powder is about $6 at Target and is a total game changer for anyone who gets oily halfway through the day. Do you also want to get a killer highlight on the cheap end? Check out the NYX Liquid Illuminator to get your glow on, which Macey also suggests putting on with your hands to save time. Eyebrows don’t have to take forever to perfect. 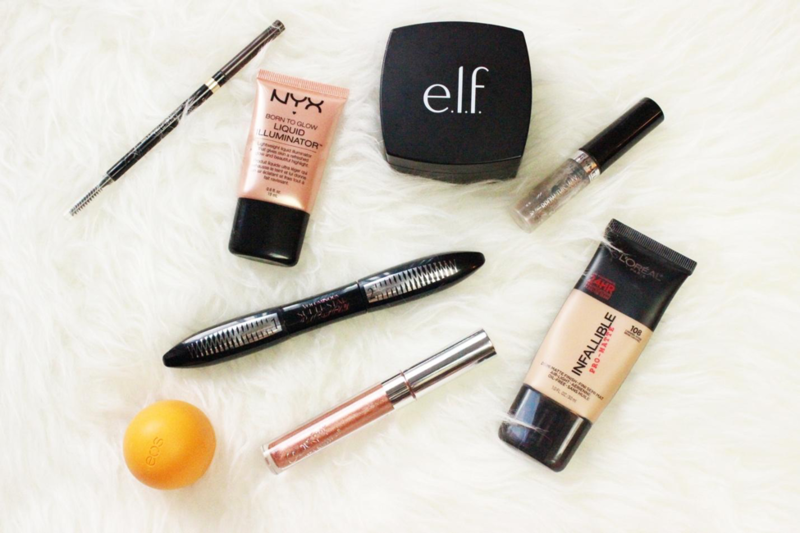 Macey recommends the L’Oreal Brow Definer ($8 at your local drugstore) for students on-the-go. The early fall semester heat can be too much for our brows to bare, so to make your eyebrows heat and water resistant, she uses the Rimmel Brow This Way Styling Gel in Clear ($4 at Ulta). “It’s almost like a finishing spray for your eyebrows,” she says. Even if you’re half asleep in your 8AM class, “any mascara that has a primer will lengthen your lashes and wake your face up.” Macey says, “the best one I’ve found yet is the L’Oreal Voluminous Superstar ($11 at Ulta). Your professor won’t even know how tired you are if you use this stuff. Lip balms will keep your pout hydrated. Macey’s favorite brand is eos ($3 at local drugstores). Of course, a makeup artist can’t go without a pop of color. “Glosses are the best for fast application and a little color,” Macey explains. Whether neutrals, pinks or even trendy metallics are your thing, Colourpop has the best quality for the price. Coming in at $6 each, Macey says every color is super pigmented and long lasting. Coffee drinkers rejoice, your gloss will look amazing even after your second iced latte of the day.